Storm Collectibles has put up a new teaser photo. 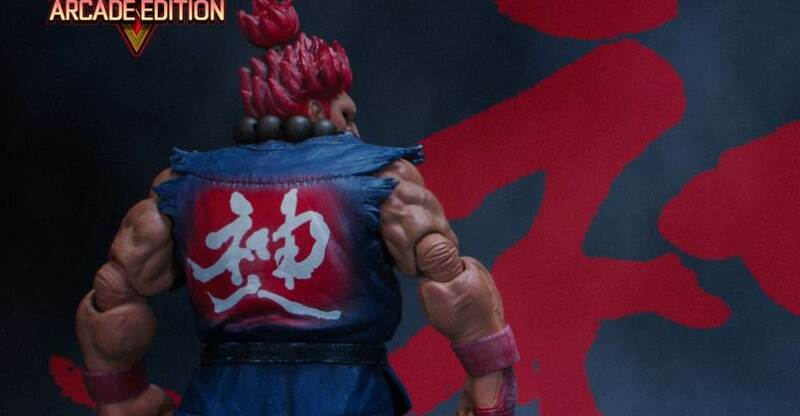 The image shows, what appears to be, a classic costume Street Fighter V – Akuma 1/12 Scale Figure. There are no additional details at this time. We will update when more info is released. Click the banner image for the full size preview. The figure looks great, but yeah...I had the same reaction. Yet ANOTHER Ryu figure. Whee, pass. If previous SF lines are any indication (with the exception of SOTA), they'll release 4-5 figures than stop production. For some reason, no company aside from SOTA has ever been able to get any traction going with this license... it's sad, really. I get that Ryu is the poster child for SF and I understand he is a lot of people's main, but come on. I feel like Ryu is always on everything and so overdone. Using Ryu is likely dictated directly by Capcom. Depends on how strict they are being with the license. Character line up may be solely or partly dictated by them. yeah...as much as I loves me some Street Fighter...you're probably right. right off the bat they should release a good mixture of the more popular/known with the less know figs. Such an large roster to choose from ...I want Juri and DeeJay in the first wave..NOT chun-li and Guile..
but..hmm...if they looked good i'll probably get em anyway. hold up dude. There's really only been one good Ryu figure, and thats the SOTA Ryu, which also is the younger Alpha-3 version of the hero. Neca's SF4 figure, I found, was bulky and rather ugly. Are there other 6/7-inch Ryu figures I am forgetting, that are fully articulated (so I am dismissing the Resaurus line, which is basically articulated statues) ? Anyway, getting the SOTA figures has been rather difficult lately as their prices has gone up. The fact that they are releasing this is at least comforting, assuming it will be reasonably priced and the proportions look pretty good. So I am not yawning, I am actually pretty excited for the remaining roster, especially Ken and Vega. I imagine these will be $50 each like the Mortal Kombat figures. I hope it's a 6.7 inch figure. Storm Collectibles should do an Akuma figure. 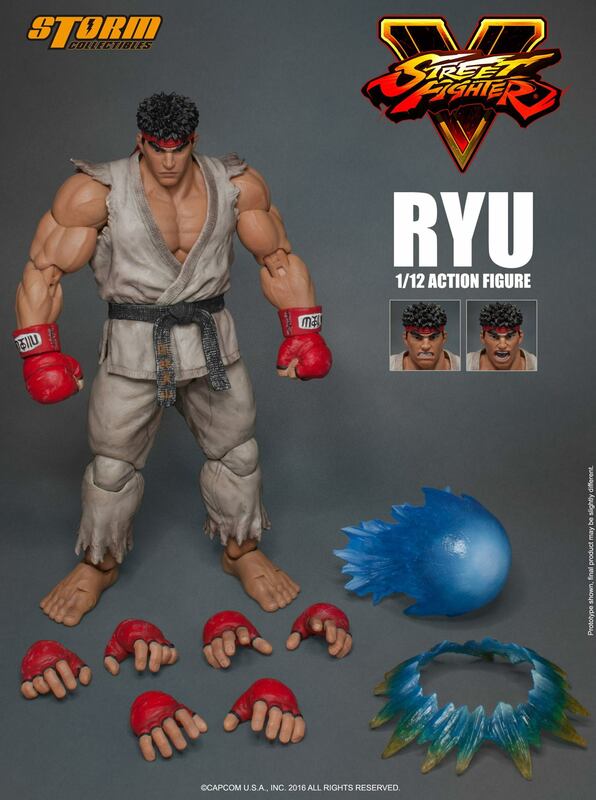 There were a couple of other Ryu's put out there, like the Jakks Pacific, and the upcoming 1/12 Ryu by PCS. Then there was the failed Kickstarter from Cappo Toys, which also featured Ryu, as well as the import figures (such as Revoltech). There hasn't been a good abundance of Ryu toys, but then again, there simply hasn't been an abundance of good Street Fighter toys in general. After Sot's entries, there really isn't any. My issue is simply with the character himself, who poster boy or not, I just find him to be incredibly dull and boring, both from a story and a design perspective. He NEVER changes. Even Ken (another poster boy I am not a fan of) has changed looks and appearances over the years. Same with Scorpion and Subzero over at the MK franchise. But Ryu is still rocking that same look from over 20 years ago, and it's tiresome and boring, especially when no matter what, you know he will always be the first character out the gate. 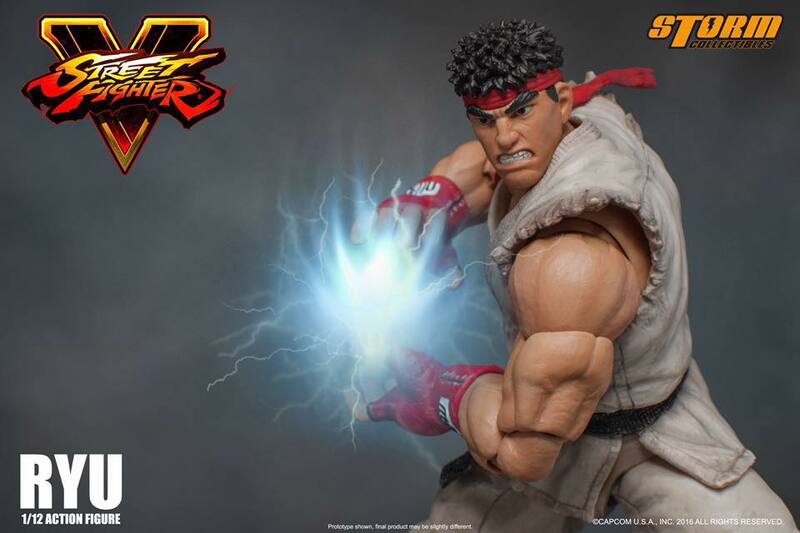 For Ryu fans, this is an awesome chance to finally get a decent figure of him, and I can understand your excitement, however for many of us long time fans, we simply had our fill a long time ago. Had the first character been any other character (other than Ken or Akuma...as they are tiresome as well) I would have been interested. Yet because it's Ryu, it's forced me to check out already. FYI, the PCS Toys Street Fighter line will be 1/6 scale not 1/12 scale. Oops...I knew it was a 12 inch figure, but typed 1/12 (as in 12 inches) instead of 1/6. I should know better by now. Dyslexia at it's finest. No worries. Didn't know if wrong size was floating around online. I'm holding out hope these will be worthwhile, but $50 per figure is a little more than I'd likely spend. I just want ryu ken and cammy, maybe dan and ibuki too. DeeJay, Juri, Juni & Juli, Karin, Charlie, Eagle, 12, and Q. Odd choices I know, but since I have the most of the main cast of the original games thanks to SOTA...these are the guys I've been aching for years over. Especially DeeJay. That particular hole in my collection causes my poor heart to ache every time I look at my lineup. I'd love to see someone outdo SOTA...but I don't think it can happen! Just hope wave 2 is Karin Kanzuki, Charlie Nash, Rainbow Mika, or even Necalli. But I feel like its gonna be boring old Ken, Cammy, 'Chunners' and Guile. Wake me when we see someone new. decent enough figure....but don't mean d*ck without a good lineup of others characters. Well the updated photos got me feeling some kind of way. I really like the way the articulation turned out. It looks like he can get in all of his Iconic poses, yet the Articulation looks great and nothing looks out of place. I know I already said how disappointed I am in another Ryu, but that level of detail for the scale really makes for a great looking figure. I hope this line does gain some traction and can stick around for a little while. Great point Joe about Capcom dictating the character selection. Here I am throwing hate at all the companies that have tried to recreate the wheel when in actuality it is Capcom saying "WE NEED ANOTHER WHEEL!" I think if these show up at Barnes and Noble I will pick them up with the monthly coupons, but if I have to pay full retail I will likely cherry pick my must haves. Really? Because I'm not even a big fan of Street Fighter but something about this figure itself stands out to me. 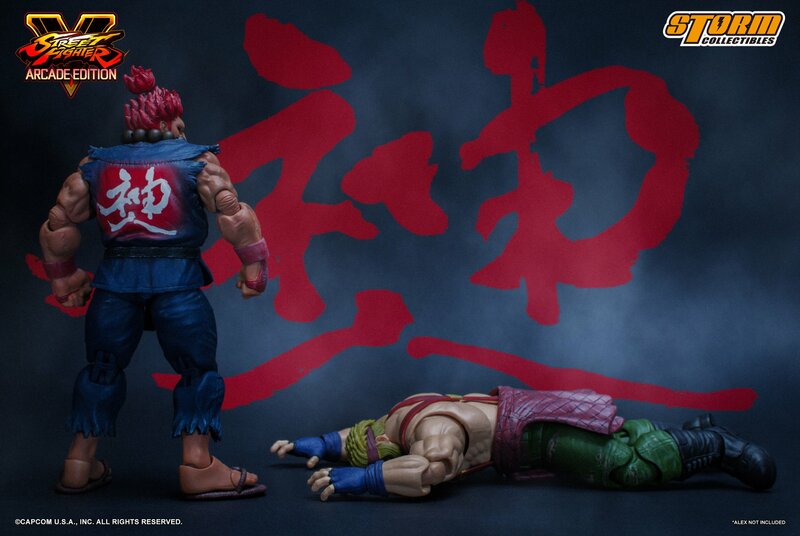 I actually really want it now it looks awesome and would be really cool to get a Akuma figure to pose with him. I'm curious if your opinion has changed (also) with the slew of new pictures came out. Wish he came with his duffle bag.